You are here: Home / Appraisal / Do I have to repair it now, or can I wait until the loan closes? Do I have to repair it now, or can I wait until the loan closes? I was speaking with a real estate agent friend recently about FHA appraisals and specifically about items that needed repair. Several years ago HUD made revisions to their guidelines regarding items that needed repair on an FHA purchase. I think they were attempting to make FHA loans more purchaser friendly because their requirements were much more strict than a conventional loan. Numerous requirements were changed that involved either minor or cosmetic type repairs and they changed the requirement that they must be made. They did however keep the same strict requirements regarding repair items that affected the safety, soundness and security of the occupants. Homes using FHA financing that are owner occupied are usually in acceptable condition or the buyers are willing to make repairs before it is listed and/or sold. If a home has been foreclosed on the selling bank may not want to spend any money on repairs. Sometimes FHA appraisals and loans seem to put buyers in a catch 22 situation. I’ll give you the perfect example. I recently got an appraisal assignment on a property with some concrete damage in the driveway that you can see in this photo. 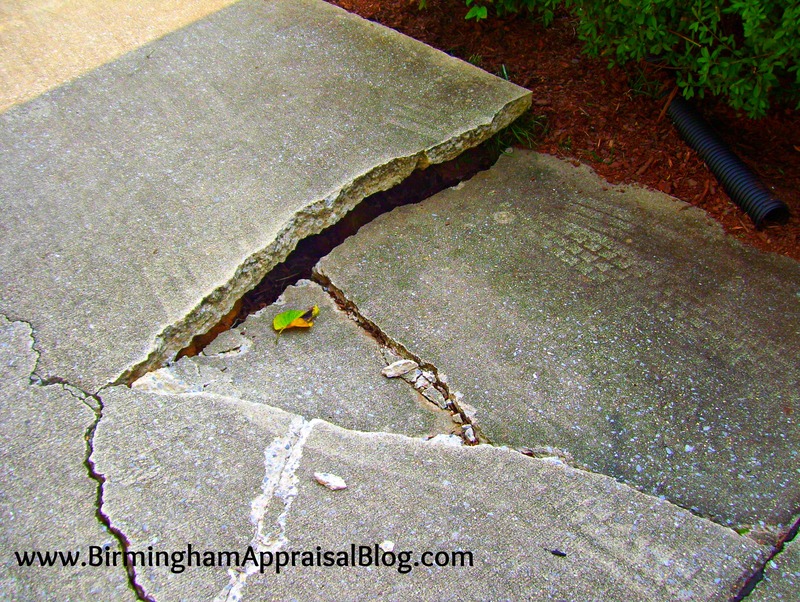 I was asked if the driveway would have to be repaired for the appraisal or if it could be done after the loan closed. Because the damage to the concrete could potentially effect the safety of the occupants it would fall under the “must be repaired now” category, if they want to use FHA/HUD financing. It could cause a trip hazard or it could contribute to further damage of the nearby home by allowing rain water to wash away supporting soil to the foundation. The buyer must work with the agent and lender to find a way for the repairs to be made before the loan closes if they want it to pass the FHA appraisal requirements. What other problems do you think this damaged driveway could cause? Let me know your thoughts on this as well as other repairs items you may not be sure about. I would like to hear from you. If you have any real estate appraisal related questions you can call me at 205.243.9304, email me, or connect with me on Facebook., Twitter, or Youtube. What would Duck Dynasty’s Si say about the Birmingham Real Estate Market? Why does the appraisal ALWAYS come in at the contract amount? Nice job, Tom. Case-in-point for you. The sweet 90-year old lady next door had one of her friends come to visit, and this friend broke her hip after tripping on a raised portion of her driveway. Doh!! I’m afraid there are many potential safety issues for a cracked driveway, which is why FHA/HUD requires them to be repaired. Thanks for sharing Ryan.